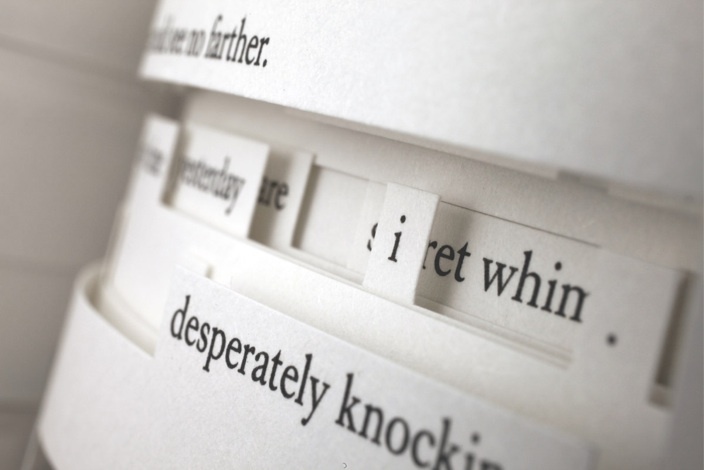 For years I had wanted to create a die-cut book by erasure, a book whose meaning was exhumed from another book. It was hardly an original idea: it’s a technique that has been practised for as long as there has been writing, perhaps most brilliantly by Tom Phillips in his magnum opus, A Humument. But the same idea in a different time is a different idea, and on the brink of the end of paper, I was attracted to the idea of a book that cannot forget it has a body. Interviewer: I don’t think this book would translate well to an iPad. Do you have an iPad? JSF: No. I have nothing against it. I love the notion that “this is a book that remembers it has a body.” When a book remembers, we remember. It reminds you that you have a body. So many of the things we may think of as burdensome are actually the things that make us more human. Next Post Men are all brothers … ?! This is fascinating, sigrun…The timely twist you’ve put on erasure books re the paperless agenda. I’m all for each book having its own body. It seems and feels right to me, because that body–as with human beings–is a part of the book’s identity. I need a book to be physical because i am physical; and this touching and page turning, the weight in my hands, the soiled or torn or creased pages, my dog ear at the top left or top right of a particular page–all of this is reading to me. 1 intimate experience encompassing the emotional, cerebral, magical, and visceral exchange that is reading. I know the editors are interested in international work, and perhaps something that is fragmentary in two languages (Norwegian, English) would appeal to them! Certainly I can imagine potential for metaphor and meaning as surrounding issues of translation, among other things.